Soil-bentonite slurry trench cutoff walls have been employed widely in the US as engineered barriers to control groundwater flow and contaminant migration in the subsurface. 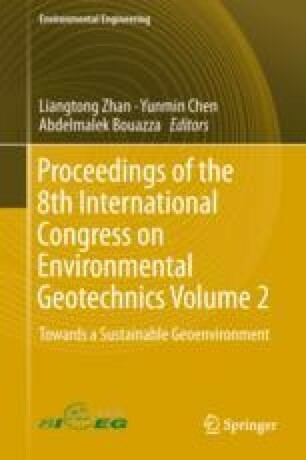 The hydraulic conductivity of the soil-bentonite backfill is stress dependent and to better understand the in-situ stress state of soil-bentonite slurry trench walls, a wall with a length of 194 m, depth of 7 m, and width of 0.9 m was constructed, instrumented, and investigated in-situ. As a part of the in-situ investigation, vane shear tests were conducted at different locations and depths to evaluate the shear strength distribution within the wall. The results indicate that the peak undrained shear strength value, Su, exhibits a consistent trend with increasing depth. In general, two stages of Su were observed: (1) at depth from 1 to 2.5 m, the Su decreases as depth increases, presumably due to the effects of the cover soil and groundwater level; (2) at depth of 2.5 to 7 m, the Su shows insignificant change with depth and falls into the range of 5 to 10 kPa. Using a constant shear strength to effective stress ratio, Su/σ′, the stresses predicted from the vane shear strength tests were in good agreement with those measured using earth pressure sensors embedded at the time of wall construction. The financial support of the National Science Foundation (Grant No. 1463198) is greatly appreciated. The authors would like to thank Central Builders Supply (Montandon, PA), CETCO (Hoffman Estates, IL) and Geo-Solutions, Inc. (New Kensington, PA) for their resources, bentonite supply and wall construction for this study. Special thanks goes to James Gutelius, Director of Laboratories for the Department of Civil and Environmental Engineering, Bucknell University, as well as Landon Barlow, graduated student of Bucknell University for their great assistance and contribution on data collection. Finally, the authors appreciate the financial support through the generosity of Michael and Laureen Costa, which enabled Yuling Yang’s postdoctoral research on this study.